O’zapft is… or time to cake it. Here is my version of a Bavarian Oktoberfest Cake. What do you think of it? Here is an overview of how I made it. 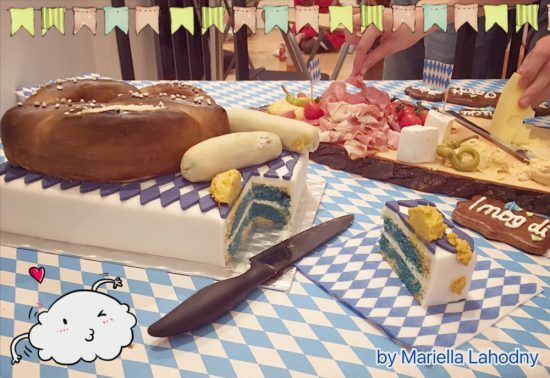 Then I prepared 4 lb of Yo’s Ultimate Vanilla Cake (https://howtocakeit.com/blogs/cakes/53602753-yos-ultimate-vanilla-cake-for-kin-community-and-my-favourite-fondant-hacks), divided the batter in half and colored one half Bavarian blue using gel food coloring. 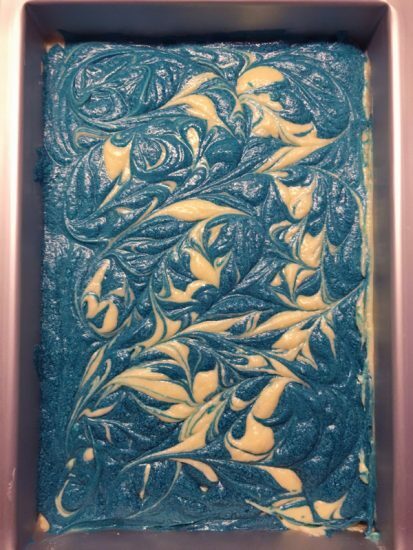 Then I poured stripes of white-blue-white-blue cake batter into a 8×12-inch (20,3×30,5 cm) baking pan and marbled it. 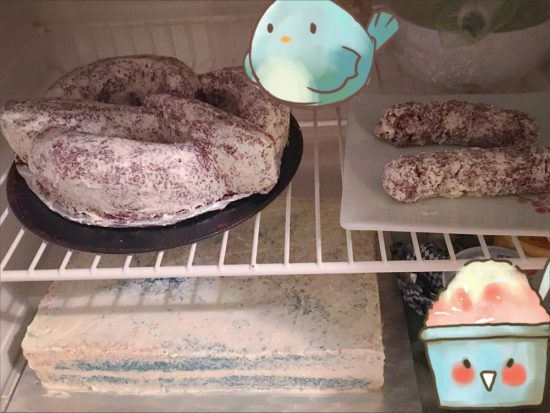 After baking the cakes I let them cool in der pans completely and put them into the fridge overnight. ½ cup water are heated up and have to simmer until all of the sugar is dissolved. The syrup has to completely cool down before it is used. I started by cutting off any caramelization, leveling, filling and crumb coating the rectangle cake with the previously prepared buttercream. Next I cut out a cardboard stencil for my pretzel. 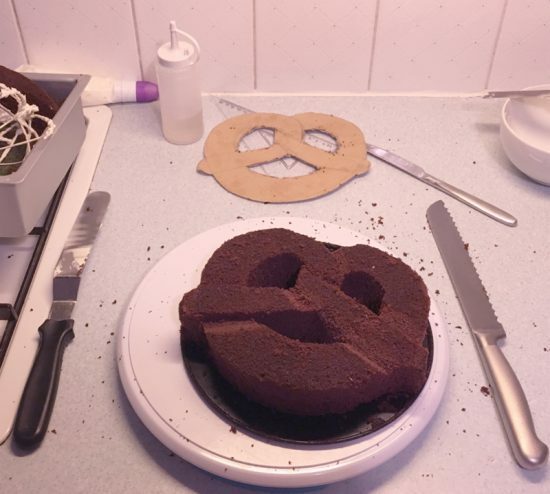 Then I roughly leveled my round chocolate cake and started to cut out the pretzel shape using a serrated steak knife. When I was happy with the general shape I started to round the edges and give it more dimension. 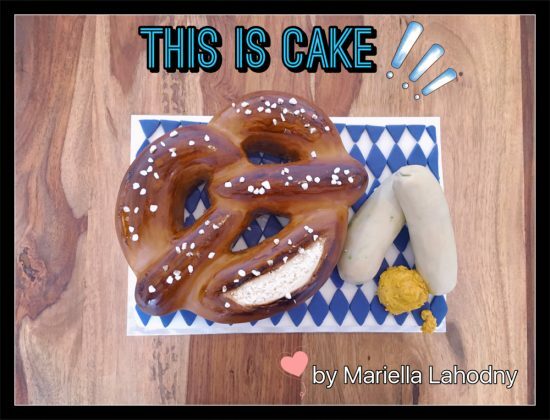 Finally I crumb coated the pretzel and put it back into the fridge. For the sausages I used some of the chocolate cake cut-offs. For each sausage I needed 3 cylindrical pieces. A small round cookie cutter came on handy. I attached them to each other with buttercream, rounded the ends with my knife, crumb coated and chilled them. For the bottom cake I put a final layer of buttercream on my vanilla cake, tried to get it as smooth as possible. Then rolled out some white fondant and covered it. 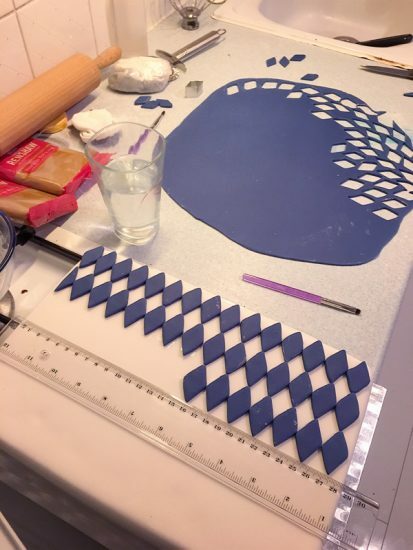 For the typical pattern of the Bavarian flag, I used some pre-colored blue fondant and added some more gel food coloring until I got the hue I desired. I rolled it out as thin as possible and cut out little diamond shapes. Those were attached to the cake using a little bit of water on a cake decorating brush. To keep a straight line, a clear plastic ruler come on handy. To give the pretzel more stability I cut my cardboard stencil a little bit smaller, covered it with aluminum foil and used it as a cake board. Then a smeared a thin coat of buttercream on the pretzel-cake and smoothed it out a bit. For fondant I first used a little bit of white fondant that I colored a very light natural dough color. I formed a little rope and layed it on the bottom of the pretzel, where the naturally would crack when baking. Then I covered just that area with some more of the light colored fondant. After that, I covered the whole pretzel cake with gingerbread colored fondant. Before smoothing it out, I carefully cut out a piece to reveal the lighter colored fondant and gave it some texture using a toothpick. 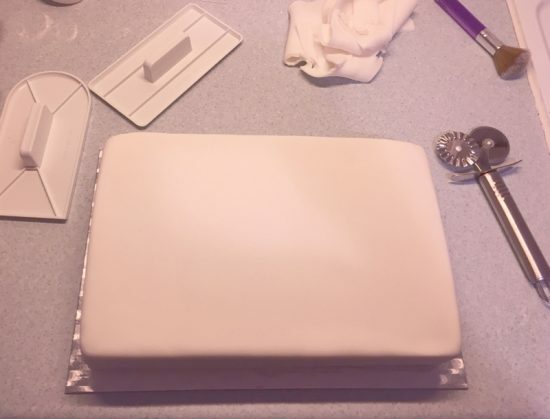 Covering the top and the outside of the cake was no problem but those three holes were just arrrr…… To fill any uncovered gaps I rolled out small pieces of fondant and attached them where necessary and blended out any seams. Using my hands and various modeling tools I shaped all the previously carved ridges and nooks. After more time in the fridge I added the final touches. 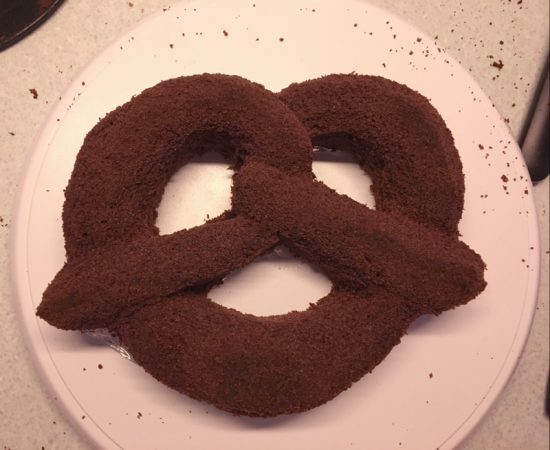 Brown food coloring mixed with a little clear alcohol was brushed on to really enhance any areas that would get darker when baked in the oven (if it were a real pretzel). 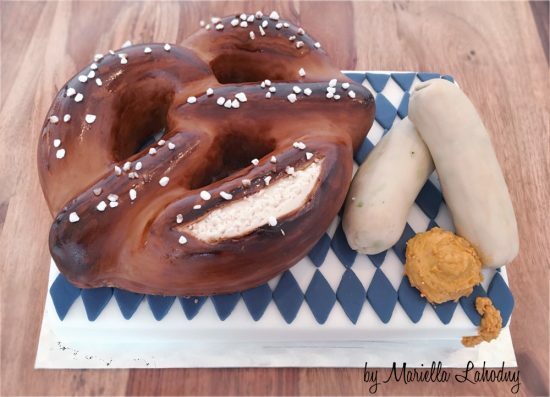 Finally I glued on some very coarse sugar (Hagelzucker in German) using edible glue and lifted the pretzel onto the Bavarian flag cake. The sausages were relatively easy to decorate: final coat of buttercream, covered in fondant, done. To support their structure I also made two little cake boards out of two aluminum foil covered piece of cardboard. I used some real white sausages (Weisswürste) as a guide to get the color right. They have quite a greyish look. To meme the look of the herbs shining trough the skin, I sprinkled some finely crushed green meringues onto the fondant straight before rolling it out. To give the sausages a little sheen I brushed some alcohol mixed with a tiny dab of ivory food coloring on. Now it was time to assemble the cake and ad some yellow-mustard colored buttercream mixed with some round sprinkles (mine were yellow, dark pink and light pink).